November 09's Calendar (Mac), originally uploaded by Headphonaught. I've posted November's calendar on Flickr. 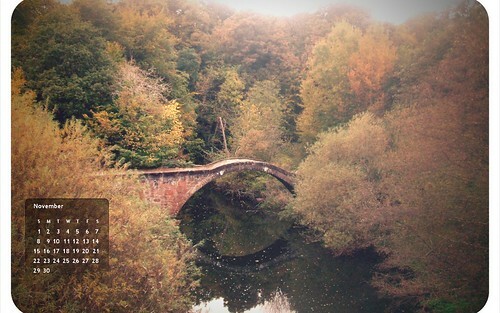 Based on this pic of the Roman Bridge in Strathclyde Park... its a wee pressie from me to you. Both Mac and Windows flavours available to download. Thank you, Thomas. A lovely autumn photograph plus a Sunday to Saturday calendar is ideal for me. Makes a great desktop.